Hands down my wardrobe champions are my jeans. Skinny jeans to be exact! With my current *SAHM.....stay at home mum* lifestyle I find myself reaching for my jeans pretty much everyday. I do dabble with a boyfriend every now and again but the hubby isn't keen ;0) says he doesn't like a saggy bum.....fair enough! My go-to store for jeans is Topshop and my favourite style are the Jamie's. I think I'm right in saying that these are their bestsellers and it's not difficult to see why for all us school run mums! For a start they are high waisted, they've got a good bit of stretch thus making them comfy but maintaining their shape whilst keeping all my wobbly bits under control. Job done! They are also very skinny around the ankle too which is how I like to wear mine with boots and hi-tops. I have 4 pairs at the last count and I'm currently coveting this mid blue pair for Spring. I have it on good authority the the Toppers Leigh style is also very good too(thanks to my sis)! They are more of a mid-rise, the fabric is lighter and they are pitched as more of a super soft denim. More of a jegging material in my book but I think these will be a great weight denim-wise during the Summer. I'm not entirely faithful to Topshop for jeans......my favourite pair of ripped/distressed skinnies come from Zara. I bought mine about a year ago and I have to say they have fared very well so far. The rips on the Zara jeans are backed with fabric which can only be a good thing as no one wants to see more of my flesh than neccesary! That said, the fabric has come away on some of the holes but they still look good and shape-wise they are still going strong! They get an airing every week! Mine were around the £40 mark but these look pretty similar and they are more reasonable price-wise at £25.99...I am considering getting a pair of these too as back up for my much loved pair. Another style that I have a couple of pairs of, also from Zara are their jeggings from the TRF range. They have a great amount of stretch and are super comfy, though I would recommend to try and get them with belt loops if you can! Unless you don't mind hoick-ing them up now and again as I've found they can get a bit baggy around the waist. I can live with that though as these grey ones I have are a bargain at £17.99. Another store that I've previously enjoyed a lot of jean-success with is Gap. I have a couple of pairs of Always Skinny which I've had a few years now but they still come out every Spring as these are not so tight around the ankles and I like this style better with my skate shoes or Adidas Stan Smith's. Do you have a favourite brand or store that is your go to for jeans? What style do you tend to favour.....are you also a skinny jeans girl? I would love to hear all about your jeans preferences.....please share! 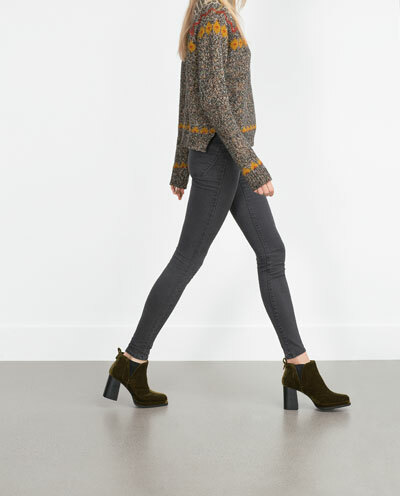 I'm definitely a skinny jeans girl and block my ears when people try to tel me that their day is over :( My teenage daughter has recently become a fan of the Topshop Jamie jeans ... so that ends my hope of getting a pair. Nothing worse in a teenager's eyes than wearing the same as their mum, lol!!! Oh yes please - do a review on the Topshop ones. I have the Jamies which are great for tucking in to boots because they are so neat fitting on the ankles but they look a bugger on me around the tummy - that needs full coverage with a big shirt or jumper. And they need a lot of hoiking. And I have the Baxters - a straight skinny cut which are great for the trainers and Stans - less carroty. I'd love to see what you think of the Joni's - they scare me. I just love my Zara jeans - some of which I've had for years & they're still going strong. I think style, quality & price wise you can't go wrong with them! I do think Jeans are the hardest thing to buy, and what suits one person is so wrong on another. But having said that I am so with you on the Topshop Jamie's...I have about four pair some of them really old now, and they do keep going, and for me the different leg lengths really help. I have recently bought a couple of Zara pairs, a cropped kick flare, which I'm loving and a gently ripped boyfriend, which is still looking ok'ish. Like you Mr NAD doesnt really get them, but then I dont rate his old weekend faithfuls much either!! I love Top Shop Jamie's too... I'm short so the fact they are sold as ankle grazers means they are the perfect length for me, I also like how the ankle is fitted so they look good tucked in to boots but equally great with sandals/ pumps in spring and summer. I read somewhere that to get your perfect fit of jeans they should always feel too tight when you first put them on as the denim relaxes as you wear it and you get your perfect look. If skinny jeans are too easy to put on then they are going to look baggy! It's great that Topshop do the different lengths isn't it! It's taken me quite a long time to get my head around the ankle grazing length as I've always thought they looked a bit short on me. However over time I have grown to love that look. The ankle skimming looks does look amazing with ballet flats and sandals in the summer doesn't it! Will look at Cain next time I'm in Toppers then! I do love my jeans, dressed up or down they just work.